Alice Hoffman always manages to instill some magic into her narrative, and a little appears in Faithful, but more believable than some of her other stories like Practical Magic or Nightbird – yet just as captivating. Hoffman weaves the story around a mother-daughter relationship after a devastating car accident. Seventeen year old Shelby Richmond was driving when the car crashed; she survived but her best friend, Helene, became a vegetable and the town saint. As Helene lies comatose in her parents’ living room, amazing miracles seem to happen to some who make the pilgrimage to her bedside – scars disappear, diseases are cured, roses bloom in February on the anniversaries of the crash. Shelby, on the other hand, shaves her head, cuts her self, becomes a drug addict, and hides in her parents’ basement – in shame and guilt at having survived. The reader follows her journey to redemption as Hoffman takes Shelby from antisocial misery to working in a pet store and eventually to veterinary school. Along the way, Shelby has help growing up and realizing how to live her second chance at life. Mysterious postcards appear intermittently in the story, and solving the mystery of the sender becomes a catalyst to reading on. When the “angel” is revealed, the story satisfyingly provides closure in a number of ways – to tell too much would spoil the reading. Despite her rocky relationship with her mother and her subsequent connections with men, it’s the dogs in Shelby’s life who are the true saviors. She rescues abused homeless dogs, taking them to live with her in her three hundred foot studio apartment. Their personalties reflect Shelby’s needs – from the French bull dog, who always leads the way, to the one-eyed small dog who needs carrying, and the gentle guardian, the white Great Pyrenees. Eventually, her mother’s toy poodle becomes part of the brood. Dog lovers will readily identify with the value of Shelby’s canine friends. Alice Hoffman’s stories always catch me unaware – before I know it I am deep in the story and cannot let go. Although the story begins on a depressing note, Hoffman quickly escalates to her real message, and the dogs in this story were an added bonus. 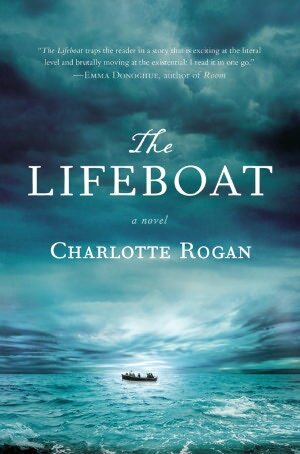 In Charlotte Rogan’s The Lifeboat, the cruise ship Empress Alexandra sinks not long after the fatal Titanic and before the sinking of the Lusitania. The prologue eliminates the stress of wondering whether the main character, Grace Winter, survives; in the first few pages, she is in a courtroom, on trial for murder on the high seas. As Grace records her “recollections” in a diary for her attorneys, she reveals her status as a woman in the early 1900s as well as her moral core. With her father’s death and subsequent loss of their fortune, the future looks grim for Grace. Her sister, Miranda, with no marriage prospects, takes a job as a governess, but Grace plots her own future with Henry, a wealthy banker – no matter that he is engaged to be married in a month. After she contrives to meet him, he falls in love with her, forsakes his fiancée, and books passage to Europe – where they can be secretly wed, without the disapproval of his mother. World War I is about to begin, and they book passage almost immediately to return to New York – but the ship sinks. Henry bribes a crewman to take Grace onto the last lifeboat – and the story begins with Grace recounting the 21 days that she drifted on the ocean with a boat full of passengers. Do you remember the writing prompt that had you choose who to save in the lifeboat? One version of the overpopulated boat has a medic who is unconscious, a little girl who has a disability, an old man who is on the brink of a major scientific discovery, an award-winning author, a crewman from the sunken ship, and a wealthy entrepreneur noted for his philanthropy. You must throw one overboard. The obvious choice might be the writer, unless you are one. Although 40 passengers are in Rogan’s Lifeboat, she focuses the story around a small cluster, including a deacon of the church, a mother with a small child, an obstreporous Unsinkable Molly, a blustery colonel, three non-English speaking Italian women, a suspicious but experienced sailor, and Grace. Rogan details the physical horrors of their trial on the unrelenting sea, but their interactions, inner thoughts, alliances, and conspiracies may be more harrowing. The Lifeboat is a riveting tale with a core ethical dilemma: what should you do to save yourself? Whether or not you get the symbolism and metaphors, the story is not what you expect.